Black Surround with Silver Inlay Glass Frame for 7" x 5"
Porreda Event Gifts > ENGRAVED GLASSWARE | Photo Frames & Certificate Holders | Black Surround with Silver Inlay Glass Frame for 7" x 5"
A deluxe jet black surround with a silver inlay will display a 7inch x 5inch landscape photo beautifully. 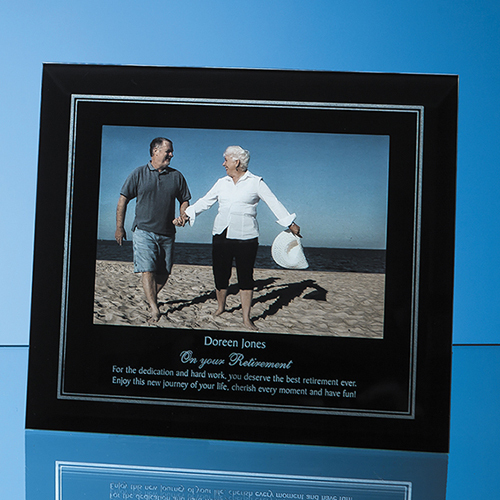 The top, bottom and side edges can be engraved, so your photo can be personalised to remember your special occasion. This photo frame can be displayed horizontally (landscape).